Genea-Musings: Can I Use the Same Ancestry Member Tree for both RootsMagic and Family Tree Maker? Can I Use the Same Ancestry Member Tree for both RootsMagic and Family Tree Maker? Can I use the same Ancestry Member Tree for both programs? On two different computers? 1) Several weeks ago, I uploaded my current "big" RootsMagic family tree (48,000 persons) to a new Ancestry Member Tree using TreeShare. 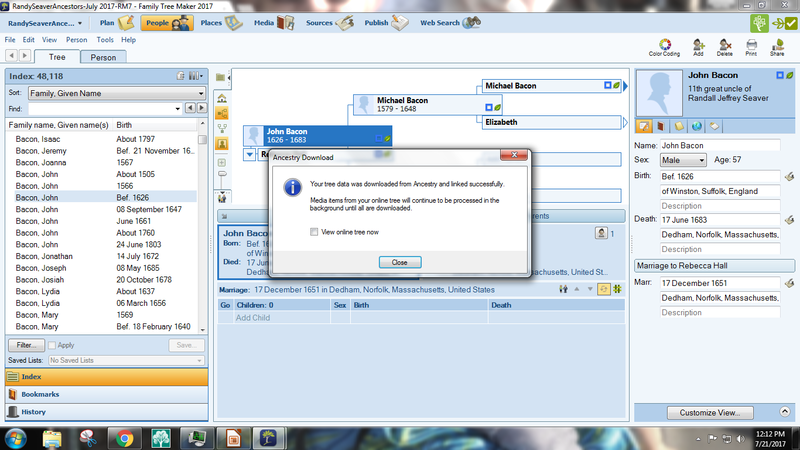 I did not add Media or Notes to the Ancestry Member Tree. Since then, I've been adding content to my RootsMagic database (new persons, new Facts, new sources, etc.) 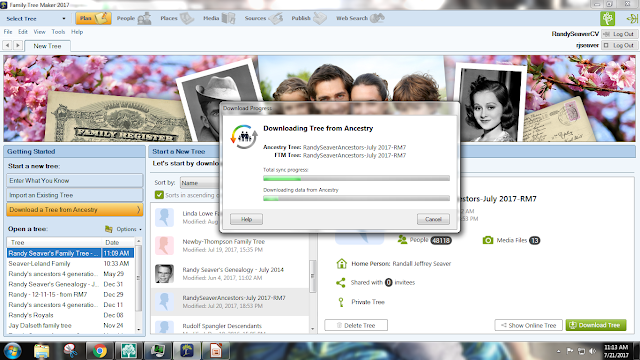 and syncing the persons with my Ancestry Member Tree. TreeShare works great, but my "best practice" is to go only one way - RootsMagic to Ancestry, not Ancestry to RootsMagic - so that I don't get Ancestry Facts, non-EE quality sources, non-standard place names, and other information that might "crap up" my RootsMagic database. Over the last three weeks, I have added some Notes and Media items to the Ancestry Member Tree using TreeShare. I copied my RootsMagic database to my laptop, and was able to connect it to my new Ancestry Member Tree. 2) Family Tree Maker 2017 was released last weekend, and I have tested it with several of my smaller databases. Today, I decided to try to download the "big" Ancestry Member Tree (the one TreeShared with RootsMagic) to a new Family Tree Maker 2017 database. * File size: 171,810 KB. It appears that the download took 27 minutes. For color coding, I can select a color for the current person, a color for all ancestors of the current person, four colors for the current person (each grandparent), or a color for all descendants. * In the name index on the left-hand side of the screen with a colored circle. I checked a number of persons in the Family Tree Maker database with the same persons in the Ancestry Member Tree, and the information appears to be the same. 5) So now I have the same information in my RootsMagic 7 database, my "big" Ancestry Member Tree, and in my Family Tree Maker 2017 database. * Add information (names, relationships, facts, media, sources, etc.) only to the RootsMagic database, using standardized place names. 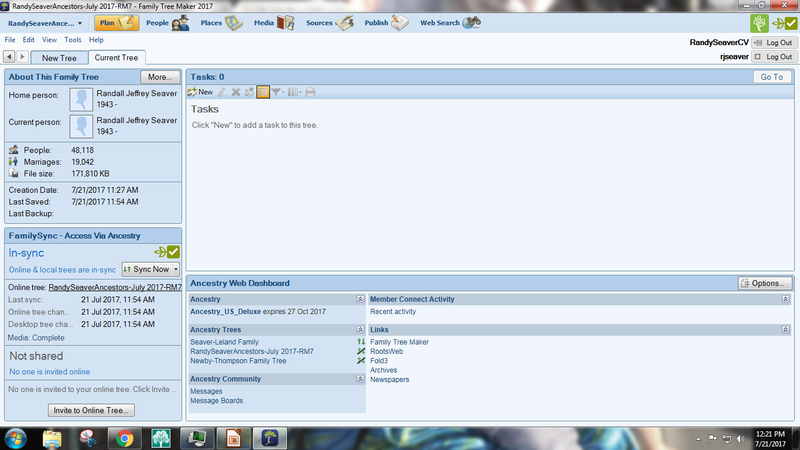 I can TreeShare on the laptop computer to update the laptop RootsMagic database. * When I have new information added, then use TreeShare to add new persons and new content for those persons to the Ancestry Member Tree. * Use FamilyShare in FTM 2017 to capture the new information in the Ancestry Member Tree and bring it into my FTM 2017 database. 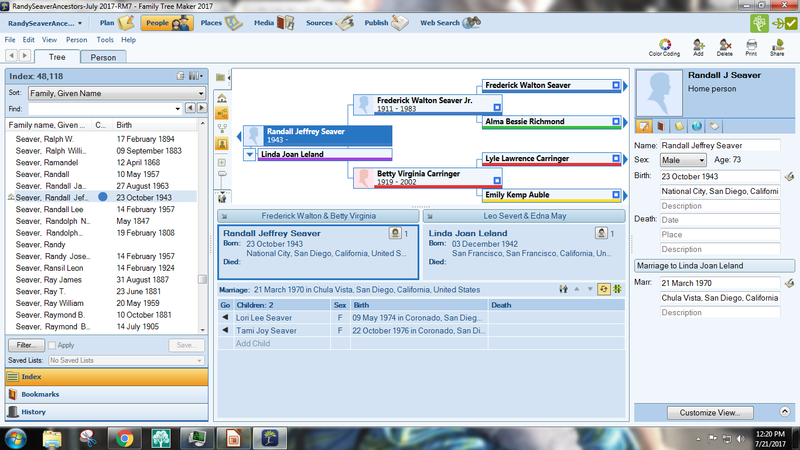 I can sync the Ancestry Member Tree with FTM 2017 on the laptop computer. * I'm also going to use this tree in the Ancestry mobile app so that I have my most up-to-date information in the mobile app, although it won't have all of my Notes and media items. * I am not going to attach any Ancestry Hints to this Ancestry Member Tree so that I avoid the problems noted above and keep all three databases as "clean" as possible. 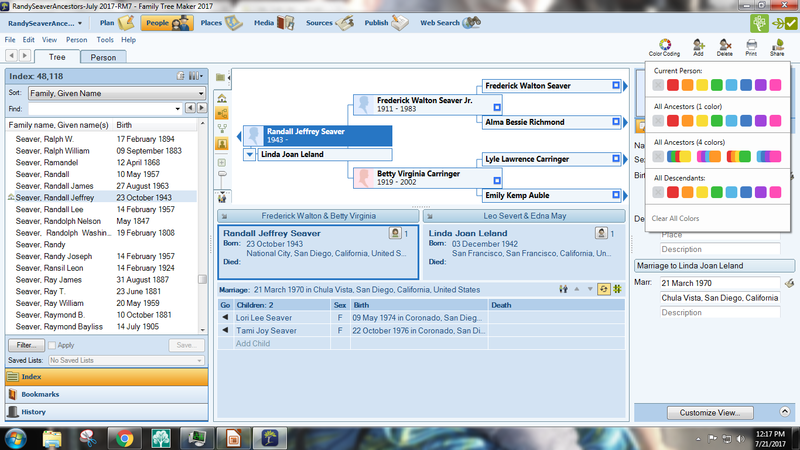 I will use Ancestry (and other) Hints to add data to the RootsMagic tree as opportunities arise. 7) In addition, I can interface persons in my RootsMagic database with matched persons in the FamilySearch Family Tree and transfer names, relationships, facts, dates, places, notes and sources between RootsMagic and the FamilySearch Family Tree. 8) It appears that the answer to my headline question is: YES, I can use the same Ancestry Member Tree to synchronize with both a RootsMagic database and a FTM 2017 database - even on two computers! We'll see how this works out. I hope that it doesn't create too much extra work for me. Stay tuned. I will do the reverse, that is keep my FTM2017 as my "master database" but have the copy, work on that copy, and Share from RootsMagic. I think your best practice and mine are the same, that is use our Genealogy Software of choice on our Computers and Share with others in the Ancestry Member Tree. 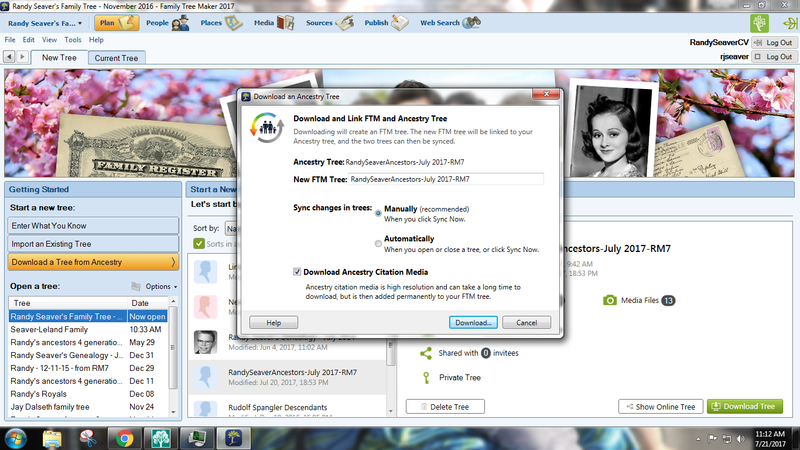 I have a much bigger reason for not downloading from Ancestry into FTM2017, which I won't go into detail here, but I will see what RootsMagic does with the Ancestry Member Tree download. I suspect it will work very well. The issue I have with the Download into FTM2017 is unique and, the best I can tell, will not impact a RootsMagic user. Let's hope that Legacy doesn't update to "sync" or "share" to Ancestry, cause then we'll have 3 to work/deal with LOL :). Good job Randy. First, your RootsMagic/TreeShare posts have been fantastic! However, I'm curious as to what tools FTM has that makes it worth the effort to pull down the data from Ancestry.